depth=μvalid if viewed from a position quite away from the normal? No, because this formula is only valid when the angles of incidence and refraction are small. When the angles of incidence and refraction are large, we cannot use relations sini = tani and sinr = tanr to derive the formula for the apparent depth. Can you ever have a situation in which a light ray goes undeviated through a prism? There is only one such situation. Light rays go undeviated through a prism only when the prism is kept in a medium that has the same refractive index as that of the prism itself. In all other situations, there will always be some minimum deviation in the path of a light ray passing through the prism. Why does a diamond shine more than a glass piece cut to the same shape? A diamond shines more because of the phenomenon of total internal reflection (TIR). The refractive index of diamond is ≈2.4 and that of glass is ≈1.5. μ=1sin C, where C is the critical angle, we get refractive index (μ). For a large refractive index, the value of the critical angle is small. Thus, for the diamond, the critical angle for total internal reflection is much smaller than that of the glass. Therefore, a great percentage of incident light gets internally reflected several times before it emerges out. A narrow beam of light passes through a slab obliquely and is then received by an eye (figure 18-Q1). The index of refraction of the material in the slab fluctuates slowly with time. How will it appear to the eye? The twinkling of stars has a similar explanation. The beam of light will seem to appear and disappear, just like the twinkling of the stars. This is because the refractive index of the material in the slab fluctuates slowly with time. So, the light rays get refracted differently with time and this causes them to get concentrated during certain times, or get diffused at other times. Can a plane mirror ever form a real image? No, a plane mirror can never form a real image. This is because in all possible situations of image formation, the light rays never actually meet after getting reflected, but they only appear to meet behind the mirror, forming a virtual image always. If a piece of paper is placed at the position of a virtual image of a strong light source, will the paper burn after sufficient time? What happens if the image is real? What happens if the image is real but the source is virtual? No, the paper will not burn even after sufficient time. This is because the piece of paper is placed at the position of a virtual image of a strong light source, so light rays are not actually converging at that point, but seem to converge. As no light rays are concentrating on the point, the paper will never burn. Instead, if the paper is placed at the position of a real image, it will burn as the light rays are actually concentrating on the point. Also, when we have the real image of a virtual source, it will also cause the burning of paper due to same reason; the light rays are actually meeting at the point. Can a virtual image be photographed by a camera? Yes, a virtual image can be photographed by a camera. This is because the light rays emitting from a virtual image and reaching the lens of the camera are real. A virtual image is formed from a reflecting surface after reflection of real incident rays, so these rays enter the camera to provide effects on the photographic film. Just like a virtual image can be seen by us in a mirror with our eyes, it can be photographed by a camera. In motor vehicles, a convex mirror is attached near the driver’s seat to give him the view of the traffic behind. What is the special function of this convex mirror which a plane mirror can not do? The special function of a convex mirror is that it creates the image of a distant object that is reduced in size, is upright or erect and always lies within the virtual focal length of the mirror. A plane mirror cannot do this. Also, as the image is formed within the focal length, the image is close to the mirror as well as is small in size, enabling the driver to clearly view the nearer vehicles behind the motor vehicle. If an object far away from a convex mirror moves towards the mirror, the image also moves. Does it move faster, slower or at the same speed as compared to the object? 1v-1f>01v>1fv<fTherefore, the image is always formed within the focal length of the mirror. Thus, the distance moved by the image is much slower than the distance moved by the object. Suppose you are inside the water in a swimming pool near an edge. A friends is standing on the edge. Do you find your friend taller or shorter than his usual height? When viewed from the water, the friend will seem taller than his usual height. Let actual height be h and the apparent height be h‘. Here, the refraction is taking place from rarer to denser medium and a virtual image is formed. μ1-u+μ2v=μ2-μ1RWhere refractive index of water is μ2 and refractive index of air is μ1. u and v are object and image distances, respectively. R is the radius of curvature, here we will take it as ∞. 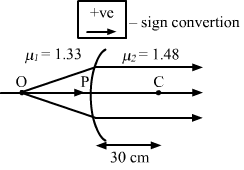 m=u×μ2um=μ2As the magnification is greater than 1, so the apparent height seems to be greater than actual height. Real depthApparent depth=μ2μ1for refraction at a plane surface. μA thin converging lens is formed with one surface convex and the other plane. Does the position of image depend on whether the convex surface or the plane surface faces the object? 1f=μ2μ1-11R1-1R2Where, f is the focal length of the thin converging lens. 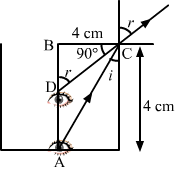 μ2 and μ1 are refractive indexes of lens and air respectively. R1 and R2 are the radius of curvature of convex and plane surfaces respectively. Here, R2 = ∞ because of the plane surface. 1f=μ2μ1-11∞-1R11f=-μ2μ1-11R1 …(ii)For Case 1, the focal length is positive and for the Case 2 the focal length is negative. Thus, the image distance is different in both cases. A single lens is mounted in a tube. A parallel beam enters the tube and emerges out of the tube as a divergent beam. Can you say with certainty that there is a diverging lens in the tube? Yes, we can say so with certainty, as only a diverging lens can cause a parallel beam of light to diverge. An air bubble is formed inside water. Does it act as a converging lens or a diverging lens? It will act as a diverging lens. This is because the refractive index of air is less than that of water. Thus, light will diverge after passing through the bubble. Two converging lenses of unequal focal lengths can be used to reduce the aperture of a parallel beam of light without loosing the energy of the light. This increase the intensity. Describe how the converging lenses should be placed to do this. Let the two converging lenses be L1 and L2, with focal lengths f1 and f2 respectively. To reduce the aperture of a parallel beam of light without losing the energy of the light and also increase the intensity, we have to place the lens L2 within the focal range of L1. If a spherical mirror is dipped in water, does its focal length change? No, the focal length of mirror will not change. This is because the focal length of a mirror does not depend on the refractive index of the medium in which the light rays travel. If a thin lens is dipped in water, does its focal length change? Yes, the focal length of the lens will change. This is because its focal length is dependent on the medium in which the light rays travel. Can mirrors give rise to chromatic aberration? No, mirrors cannot give rise to chromatic aberration. This is because chromatic aberration occurs due to the refraction of different colours of light. In case of mirrors, refraction of light does not take place. A laser light is focussed by a converging lens. Will there be a significant chromatic aberration? No, there will not be a significant chromatic aberration because a laser light is monochromatic in nature. Therefore, all light will get converged at the same point. A point source of light is placed in front of a plane mirror. (a) All the reflected rays meet at a point when produced backward. (b) Only the reflected rays close to the normal meet at a point when produced backward. (c) Only the reflected rays making a small angle with the mirror meet at a point when produced backward. (d) Light of different colours make different images. Here, the angle of reflection is equal to the angle of incidence. Therefore, all rays get reflected to converge at a single point to form the point image of the point source. (d) the refractive indices of the two media are widely different. In this case the incident angle is greater than critical angle, so the light gets reflected back into the same denser medium, instead of being refracted . (d) show minimum dispersion effect. Since, when reflected back, they meet at a single point forming a point image of a point source. (d) 15 cm behind the mirror. (d) may be any spherical mirror. This is because the reflected rays are still parallel, which is only possible if the mirror is a plane mirror. A spherical mirror will either converge or diverge the reflected rays. (d) is certainly virtual if the object is real. As a virtual object is the virtual image of the object, it is always formed beyond the focus of the concave mirror. Thus, the image formed by a concave mirror of the virtual object will always be real. (d) two images form, one at O‘ and the other at O“. Four modifications are suggested in the lens formula to include the effect of the thickness t of the lens. Which one is likely to be correct? tμwill be quite small, it can be ignored. (d) more than 2 f.
Since the object is placed at 2 f, the image of the object will be formed at distance of 2 f from a converging lens. (d) first increases then decreases. Since all beams of light are parallel to the principal axis, they will converge at the focus of a converging lens. Thus, the intensity of light increases till one reaches the focus and then starts decreasing as one moves beyond it. The lens is cut into two equal parts by a plane perpendicular to the principal axis. Thus, the radius of curvature of both the lenses become half of its original value. f=R2P=1fRadius of curvature becomes half. Therefore, the focal also reduces to half its original value. Thus, the power (P) of the two cut-lenses will be equal. As the lens is cut along the principal axis, the two new lens will act as two double convex lenses. Even after cutting the lens, the radius of the curvature of the two new lens will remain the same as that of the original lens, with the power equal to the original lens. 1F=1f1+1f2 F = f1f2f1+f2Hence, the focal length will increase. 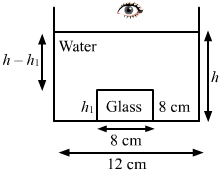 Since the refractive index of lens is more than that of of water and both the sides are convex, it will act like a normal convergent lens (though its focal length will change). Since the refractive index of lens is less than that of of water and both the sides are convex, it will act like a normal diverging lens (though its focal length will change to negative). As the focal length of the lens is 20 cm and object distance is 40 cm from the lens, the image is formed at the centre of curvature at the right side of the lens. When light rays of different colours do not converge at the same point after passing through a converging lens, it is called chromatic aberration. This happens because a lens has different refractive indices for different colours, i.e, for different wavelengths of light. A concave mirror having a radius of curvature 40 cm is placed in front of an illuminated point source at a distance of 30 cm from it. Find the location of the image. Hence, the required image will be located at a distance of 60 cm in front of the concave mirror. A concave mirror forms an image of 20 cm high object on a screen placed 5.0 m away from the mirror. The height of the image is 50 cm. Find the focal length of the mirror and the distance between the mirror and the object. -vu=h2h1or -(-500)u=5020Where ‘u‘ is the distance of object from screen. or -1f=710or f=-107=-1.44 mHence, the required focal length of the concave mirror is 1.44 m.
A concave mirror has a focal length of 20 cm. Find the position or positions of an object for which the image-size is double of the object-size. 1v+1u=1f⇒ -12u-1u=1f⇒ 32u=1f⇒ u=3f2=30 cmHence, the required positions of objects are 10 cm or 30 cm from the concave mirror. A 1 cm object is placed perpendicular to the principal axis of a convex mirror of focal length 7.5 cm. Find its distance from the mirror if the image formed is 0.6 cm in size. m=-vu=hih0=0.6 Using mirror equation,1v+1u=1f⇒ 10.6u-1u=1f⇒ 53u-1u=215⇒ u=5 cmHence, the distance of the object from the mirror is 5 cm. A candle flame 1.6 cm high is imaged in a ball bearing of diameter 0.4 cm. If the ball bearing is 20 cm away from the flame, find the location and the height of the image. 1(-20)+1v=20.2⇒ 1v=120+10⇒ v=0.1 cm or 1.0 mm inside the ball bearing.Magnification=m=A’B’AB=-vu=m=A’B’200=1200⇒ A’B’=AB200=+1.6200=+0.08 cm (+0.008 cm)Hence, the distance of the image is 1 cm. Height of the image is 0.008 cm. A 3 cm tall object is placed at a distance of 7.5 cm from a convex mirror of focal length 6 cm. Find the location, size and nature of the image. ⇒ A’B’AB=107.5×3⇒ A’B’=10075=43=1.33 cmWhere A’B’ is the height of the image. 103 cmfrom the pole and image height is 1.33 cm. Nature of the image is virtual and erect. A U-shaped wire is placed before a concave mirror having radius of curvature 20 cm as shown in figure. Find the total length of the image. A man uses a concave mirror for shaving. He keeps his face at a distance of 25 cm from the mirror and gets an image which is 1.4 times enlarged. Find the focal length of the mirror. Hence, the required focal length of the concave mirror is 87.5 cm. When the light strikes on a surface nearly parallel to it, it then bends by a small and fixed angle after reflection. Also, when the light travels from one medium to another with slight differences in their refractive indices, it bends by a small angle. Thus, the bending of light by a small but fixed angle can be the case of either reflection or refraction. (a) If the incident rays are converging, we have a real object. (b) If the final rays are converging, we have a real image. (c) The image of a virtual object is called a virtual image. (d) If the image is virtual, the corresponding object is called a virtual object. This is because a real image is formed by converging reflected/refracted rays from a mirror/lens. Which of the following (referred to a spherical mirror) do (does) not depend on whether the rays are paraxial or not? Paraxial rays are the light rays close to the principal axis. The focus of the spherical mirror for paraxial rays are different from the focus for marginal rays. So, the focus depends on whether the rays are paraxial or marginal. â€‹The pole, radius of curvature and the principal axis of a spherical mirror do not depend on paraxial or marginal rays. (d) the object is virtual but the image is real. The virtual image of a real object and the real image of a virtual object are always erect. (d) the intensity of the image will decrease. If the upper half portion of the convex lens is painted, then only the intensity of the image will decrease, as the amount of light passing through the lens will decrease. Also, there will be no shift in the position of the image because all the parameters remain the same. (b) there will be an image at O2. (d) the only image will form away from O2. The lens L1 converges the light at point O1 and lens L2 converges the light at O2. As the upper half of lens L3 has a refractive index equal to that of L1, it will converge the light at O1 and thus the image will be formed at O1. Also, the lower half of lens L3 has a refractive index equal to that of lens L2, it will converge the light at O2 and thus the image will be formed at O2. (d) must not be less than 10 cm. Let the image be formed at a distance of x cm from the lens. Find the diameter of the image of the moon formed by a spherical concave mirror of focal length 7.6 m. The diameter of the moon is 3450 km and the distance between the earth and the moon is 3.8 × 105 km. ∴ 1v+-13.8×108=-17.6As we know, the distance of moon from earth is very large as compared to focal length it can be taken as ∞. Therefore, image of the moon will be formed at focus, which is inverted. Hence, the required diameter of the image of moon is 6.9 cm. A particle goes in a circle of radius 2.0 cm. A concave mirror of focal length 20 cm is placed with its principal axis passing through the centre of the circle and perpendicular to its plane. The distance between the pole of the mirror and the centre of the circle is 30 cm. Calculate the radius of the circle formed by the image. Therefore, image of the circle is formed at a distance of 60 cm in front of the mirror. ⇒ -(-60)(-30)=Rimage2Where Robject and Rimage are radius of the object and radius of the image, respectively. Hence, the required radius of the circle formed by the image is 4 cm. 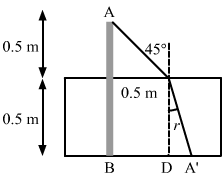 A concave mirror of radius R is kept on a horizontal table (figure). Water (refractive index = μ) is poured into it up to a height h. Where should an object be placed so that its image is formed on itself? A concave mirror of radius ‘R‘ kept on a horizontal table. ‘h‘ is height up to which the water is poured into the concave mirror. Let the object be placed at height ‘x‘ above the surface of water. We know if we place the object at the centre of curvature of the mirror, then the image itself will be formed at the centre of curvature. Therefore, the apparent position of the object with respect to the mirror should be at the centre of curvature so that the image is formed at the same position. A point source S is placed midway between two converging mirrors having equal focal length f as shown in figure. Find the values of d for which only one image is formed. Two converging mirrors having equal focal length ‘f ‘. When the point source ‘S’ is at focus, i.e., at a distance ‘f ‘ from each mirror, the rays from the source after reflecting from one mirror will become parallel and so these parallel rays, after the reflection from the other mirror the object itself. Thus, only one image is formed. A converging mirror M1, a point source S and a diverging mirror M2 are arranged as shown in figure. The source is placed at a distance of 30 cm from M1. The focal length of each of the mirrors is 20 cm. Consider only the images formed by a maximum of two reflections. It is found that one image is formed on the source itself. (a) Find the distance between the two mirrors. (b) Find the location of the image formed by the single reflection from M2. Point source is at a distance of 30 cm from M1. Thus, the image formed by the single reflection from M2 is at a distance of 10 cm from mirror M2. A light ray falling at an angle of 45° with the surface of a clean slab of ice of thickness 1.00 m is refracted into it at an angle of 30°. Calculate the time taken by the light rays to cross the slab. Speed of light in vacuum = 3 × 108 m s−1. So, v=3×1082 m/sLet x be the distance travelled by light in the slab. A pole of length 1.00 m stands half dipped in a swimming pool with water level 50.0 cm higher than the bed. The refractive index of water is 1.33 and sunlight is coming at an angle of 45° with the vertical. Find the length of the shadow of the pole on the bed. Water level of the swimming pool is 50.0 cm higher than the bed. A small piece of wood is floating on the surface of a 2.5 m deep lake. Where does the shadow form on the bottom when the sum is just setting? Refractive index of water = 4/3. An object P is focussed by a microscope M. A glass slab of thickness 2.1 cm is introduced between P and M. If the refractive index of the slab is 1.5, by what distance should the microscope be shifted to focus the object again? =132.1=0.7 cmHence, the microscope should be shifted by 0.70 cm to focus the object ‘P‘ again. A vessel contains water up to a height of 20 cm and above it an oil up to another 20 cm. The refractive indices of the water and the oil are 1.33 and 1.30 respectively. Find the apparent depth of the vessel when viewed from above. Hence, apparent depth = 40 − (9.6) = 30.4 cm between the surface. 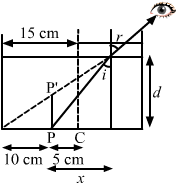 Locate the image of the point P as seen by the eye in the figure. Hence, location of image of point P is located 0.2 cm above point P.
k transparent slabs are arranged one over another. The refractive indices of the slabs are μ1, μ2, μ3, … μk and the thicknesses are t1 t2, t3, … tk. An object is seen through this combination with nearly perpendicular light. Find the equivalent refractive index of the system which will allow the image to be formed at the same place. k number of transparent slabs are arranged one over the other. ∆t=1-1μ1t1+1-1μ2t2+…+1-1μktk …(i)Let μ be the refractive index of the combination of slabs. The image is formed at the same place. A cylindrical vessel of diameter 12 cm contains 800π cm3 of water. A cylindrical glass piece of diameter 8.0 cm and height 8.0 cm is placed in the vessel. If the bottom of the vessel under the glass piece is seen by the paraxial rays (see figure), locate its image. The index of refraction of glass is 1.50 and that of water is 1.33. Let h be the final height of the water column. ∆t1=1-1μgtg=1-132×8=2.26 cm∆t2=1-1μwtw=1-143×25.7-8=4.44 cmHence, the total shift = (Δt1+ Δt2) = (2.66 + 4.44) cm = 7.1 cm above the bottom. Consider the situation in figure. The bottom of the pot is a reflecting plane mirror, S is a small fish and T is a human eye. Refractive index of water is μ. (a) At what distance(s) from itself will the fish see the image(s) of the eye? (b) At what distance(s) from itself will the eye see the image(s) of the fish. Refractive index of water = μ. Let us take x as the distance of the image of the eye formed above the surface of the water as seen by the fish. H2y=μ, So y=H2μWhere, y is the distance of the image of the fish below the surface as seen by the eye. H+y=H+H2μ=H1+12μAgain another image of fish will be formed H/2 below the mirror. A small object is placed at the centre of the bottom of a cylindrical vessel of radius 3 cm and height 4 cm filled completely with water. Consider the ray leaving the vessel through a corner. Suppose this ray and the ray along the axis of the vessel are used to trace the image. Find the apparent depth of the image and the ratio of real depth to the apparent depth under the assumptions taken. Refractive index of water = 1.33. A cylindrical vessel, whose diameter and height both are equal to 30 cm, is placed on a horizontal surface and a small particle P is placed in it at a distance of 5.0 cm from the centre. An eye is placed at a position such that the edge of the bottom is just visible (see figure). The particle P is in the plane of drawing. Up to what minimum height should water be poured in the vessel to make the particle P visible? sin i sin r=1μwsin i sin r=34As r =45°⇒sin i=342Point P will be visible when the refracted ray makes an angle of 45Ëš at the point of refraction. Let x be the distance of point P from X. A light ray is incident at an angle of 45° with the normal to a √2 cm thick plate (μ = 2.0). Find the shift in the path of the light as it emerges out from the plate. =0.406×AB=AEcos 21°×0.406=0.62 cmHence, the required shift in the path of light is 0.62 cm. An optical fibre (μ = 1.72) is surrounded by a glass coating (μ = 1.50). Find the critical angle for total internal reflection at the fibre-glass interface. A light ray is incident normally on the face AB of a right-angled prism ABC (μ = 1.50) as shown in figure. What is the largest angle Ï• for which the light ray is totally reflected at the surface AC? Let us take θc as the critical angle for the glass. Find the maximum angle of refraction when a light ray is refracted from glass (μ = 1.50) to air. We know from the definition of a critical angle (θc) that if a refracted angle measures more than 90°, then total internal reflection takes place. Hence, the maximum angle of refraction is 90°. Light is incident from glass (μ = 1.5) to air. Sketch the variation of the angle of deviation δ with the angle of incident i for 0 < i < 90°. 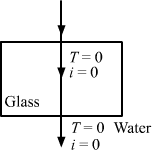 The angle of deviation (δ) due to refraction from glass to air increases as the angle of incidence increases from 0° to 40°48″. The angle of deviation (δ) due to total internal reflection further increases from 40°48″ to 45° and then it decreases, as shown in the graph. Light is incident from glass (μ = 1.50) to water (μ = 1.33). Find the range of the angle of deviation for which there are two angles of incidence. Here, if the angle of incidence increased beyond the critical angle, total internal reflection occurs and deviation decreases. Light falls from glass (μ = 1.5) to air. Find the angle of incidence for which the angle of deviation is 90°. Light falls from glass to air. In this case, total internal reflection must have taken place. Hence, the required angle of incidence is 45°. A point source is placed at a depth h below the surface of water (refractive index = μ). (a) Show that light escapes through a circular area on the water surface with its centre directly above the point source. (b) Find the angle subtended by a radius of the area on the source. Let the point source be P, which is placed at a depth of h from the surface of water. Let us take x as the radius of the circular area. and let θc be the critical angle. xh=tan θcxh=sin θc1-sin2 θc =1μ1-1μ2 ∵sin θc=1μxh=1μ2-1x=hμ2-1Clearly from figure, the light escapes through a circular area at a fixed distance r on the water surface, directly above the point source. That makes a circle, the centre of which is just above P.
A container contains water up to a height of 20 cm and there is a point source at the centre of the bottom of the container. A rubber ring of radius r floats centrally on the water. The ceiling of the room is 2.0 m above the water surface. (a) Find the radius of the shadow of the ring formed on the ceiling if r = 15 cm. (b) Find the maximum value of r for which the shadow of the ring is formed on the ceiling. Refractive index of water = 4/3. Ceiling of the room is 2.0 m above the water surface. Let us take R as the maximum radius. Find the angle of minimum deviation for an equilateral prism made of a material of refractive index 1.732. What is the angle of incidence for this deviation? Hence, the required angle of deviation is 60°. Find the angle of deviation suffered by the light ray shown in figure. The refractive index μ = 1.5 for the prism material. A light ray, going through a prism with the angle of prism 60°, is found to deviate by 30°. What limit on the refractive index can be put from these data? Refractive index, μ≤sinA+δm2sinA2μ≤sin60°+δm2sin60°2μ≤2sin60°+δm2As there is one ray that has been found which has deviated by 30Ëš, the angle of minimum deviation should be either equal to or less than 30Ëš but it can not be more than 30Ëš. μ≤2sin 60°+δm2μ≤2sin 60°+30°2=2sin 45°Refractive index (μ) will be more if angle of deviation (δm) is more. Locate the image formed by refraction in the situation shown in figure. Point C is the centre of curvature, the distance between C and the pole is 20 cm. Distance between source S and pole is 25 cm. ⇒ 1.5v-1(-25)=0.520 ⇒ 1.5v=-3200 ∴ v=-200×1.50.3×10=-100Hence, the required location of the image is 100 cm from the pole and on the side of S.
A spherical surface of radius 30 cm separates two transparent media A and B with refractive indices 1.33 and 1.48 respectively. The medium A is on the convex side of the surface. Where should a point object be placed in medium A so that the paraxial rays become parallel after refraction at the surface? Medium A is the convex side of surface. i.e, the image of the point object will be formed at infinity. μ2v-μ1u=μ2-μ1R⇒1.48∞-1.33u=1.48-1.3330⇒-1.33u-0.1530∴u=-266.0 cmHence, the object is placed at a distance of 266.0 cm from the convex surface on side A. Figure shows a transparent hemisphere of radius 3.0 cm made of a material of refractive index 2.0. (a) A narrow beam of parallel rays is incident on the hemisphere as shown in the figure. Are the rays totally reflected at the plane surface? (b) Find the image formed by the refraction at the first surface. (c) Find the image formed by the reflection or by the refraction at the plane surface. (d) Trace qualitatively the final rays as they come out of the hemisphere. From the figure it is seen that the angle of incidence is greater than the critical angle, so the rays are totally reflected at the plane surface. μ2v-μ1u=μ2-μ1R⇒2v–1∞=2-13 (for parallel rays u=∞)⇒2v=13⇒v= 6 cmIf we complete the sphere then the image will be formed diametrically opposite to A. By internal reflection, the image is formed in front of A. A small object is embedded in a glass sphere (μ = 1.5) of radius 5.0 cm at a distance 1.5 cm left to the centre. Locate the image of the object as seen by an observer standing (a) to the left of the sphere and (b) to the right of the sphere. An object is embedded in the glass sphere 1.5 cm left to the centre. μ1 = 1.5, μ2 = 1, v = ? =13-30130 =-17130 v=-13017=-7.65 cmTherefore, the image will be formed 7.6 − 5 = 2.6 towards left from centre. A biconvex thick lens is constructed with glass (μ = 1.50). Each of the surfaces has a radius of 10 cm and the thickness at the middle is 5 cm. Locate the image of an object placed far away from the lens. First refraction takes place at A.
μgv-μau=μg-μaR⇒1.5v–1∞=1.5-110⇒1.5v=0.510⇒v= 30 cmNow, the second refraction is at B. For this, a virtual object is the image of the previous refraction. μav-μgu=μa-μgR⇒1v-1.525=1-1.510⇒1v-1.525=-0.510⇒v= 9.1 cmHence, the image is formed 9.1 cm far from the second refraction or second surface of the lens. A narrow pencil of parallel light is incident normally on a solid transparent sphere of radius r. What should be the refractive index is the pencil is to be focussed (a) at the surface of the sphere, (b) at the centre of the sphere. u = −∞, μ1 = 1, μ2 = ? μ2v-μ1u=μ2-μ1R⇒μ2r-1-∞=μ2-1r⇒μ2r=μ2-1r⇒μ2=μ2-1The above equation is impossible. Hence, the image cannot be focused at centre. One end of a cylindrical glass rod (μ = 1.5) of radius 1.0 cm is rounded in the shape of a hemisphere. The rod is immersed in water (μ = 4/3) and an object is placed in the water along the axis of the rod at a distance of 8.0 cm from the rounded edge. Locate the image of the object. μgv-μwu=μg-μwRAs per the question, u = −8 cm. 32v–43×8=32-431⇒32v+16=16⇒v=∞Hence, the image will be formed at infinity (∞). A paperweight in the form of a hemisphere of radius 3.0 cm is used to hold down a printed page. An observer looks at the page vertically through the paperweight. At what height above the page will the printed letters near the centre appear to the observer? In the first case, the refraction is at A.
μ2v-μ1u=μ2-μ1R⇒32v-10=μ2-μ1∞⇒v=0Therefore, the image of the letter is formed at the point. For the second case, refraction is at point B.
μ2v-μ1u=μ2-μ1R1v-32×(-3)=1-32-3⇒1v+32×3=16⇒1v=16-12⇒v=-3 cmHence, there will be no shift in the final image. Solve the previous problem if the paperweight is inverted at its place so that the spherical surface touches the paper. ∆t=1-1μt=1-233=133 = 1 cmThe upper surface of the paperweight is flat and the spherical spherical surface is in contact with the printed letter. Therefore, we will take it as a simple refraction problem. Hence, the image will appear 1 cm above point A. A hemispherical portion of the surface of a solid glass sphere (μ = 1.5) of radius r is silvered to make the inner side reflecting. An object is placed on the axis of the hemisphere at a distance 3r from the centre of the sphere. The light from the object is refracted at the unsilvered part, then reflected from the silvered part and again refracted at the unsilvered part. Locate the final image formed. ⇒1v-1.53r/2=-0.5-r Here, μ1=1.5 , μ2=1 and R=-r⇒v=-2rAs negative sign indicates images formed inside APB, so image should be at C.
Therefore, the final image is formed on the reflecting surface of the sphere. The convex surface of a thin concavo-convex lens of glass of refractive index 1.5 has a radius of curvature 20 cm. The concave surface has a radius of curvature 60 cm. The convex side is silvered and placed on a horizontal surface as shown in figure. (a) Where should a pin be placed on the axis so that its image is formed at the same place? (b) If the concave part is filled with water (μ = 4/3), find the distance through which the pin should be moved so that the image of the pin again coincides with the pin. Therefore, the pin should be placed at a distance of 15 cm from the lens. A double convex lens has focal length 25 cm. The radius of curvature of one of the surfaces is double of the other. Find the radii, if the refractive index of the material of the lens is 1.5. As per the question, the radius of curvature of one surface is twice that of the other. Hence, the required radii of the double convex lens are 18.75 cm and 37.5 cm. The radii of curvature of a lens are + 20 cm and + 30 cm. The material of the lens has a refracting index 1.6. Find the focal length of the lens (a) if it is placed in air, and (b) if it is placed in water (μ = 1.33). Thus, the focal length of the lens is 100 cm when it is placed in air. Thus, the focal length of the lens is 300 cm when it is placed in water. Lenses are constructed by a material of refractive index 1.50. The magnitude of the radii of curvature are 20 cm and 30 cm. Find the focal lengths of the possible lenses with the above specifications. From the given data we can make four possible lenses, using the lens maker formula. A thin lens made of a material of refractive index μ2 has a medium of refractive index μ1 on one side and a medium of refractive index μ3 on the other side. The lens is biconvex and the two radii of curvature have equal magnitude R. A beam of light travelling parallel to the principal axis is incident on the lens. Where will the image be formed if the beam is incident from (a) the medium μ1 and (b) from the medium μ3? A biconvex lens with two radii of curvature that have equal magnitude R.
Refractive index of the material of the lens is μ2. First medium of refractive index is μ1. Second medium of refractive index is μ3. As per the question, the light beams are travelling parallel to the principal axis of the lens. (a) The light beam is incident on the lens from first medium μ1. μ2v-μ1u=μ2-μ1RWhere, v is the image distance. (b) The light beam is incident on the lens from second medium μ3. Thus, refraction takes place at second surface. μ2v-μ3-∞=μ2-μ3R⇒1v=μ2-μ3μ2R⇒⇒v=μ2Rμ2-μ3Now, refraction takes place at 2nd surface. μ1v-μ2u=μ1-μ2RHere, the image distance of the previous case becomes object distance. A convex lens has a focal length of 10 cm. Find the location and nature of the image if a point object is placed on the principal axis at a distance of (a) 9.8 cm, (b) 10.2 cm from the lens. (a) As per the question, the object distance (u) is 9.8 cm. =-490-9.8=50Therefore, the image is erect and virtual. =510-9.8=-52.04Therefore, the image is real and inverted. A slide projector has to project a 35 mm slide (35 mm × 23 mm) on a 2 m × 2 m screen at a distance of 10 m from the lens. What should be the focal length of the lens in the projector? ×2 m screen using projector. 1v-1u=1f ⇒ 110+10.175=1f ⇒ 101751750=1f ⇒ f=175010175 f=0.172 mmHence, the required focal length is 0.172 mm. A particle executes a simple harmonic motion of amplitude 1.0 cm along the principal axis of a convex lens of focal length 12 cm. The mean position of oscillation is at 20 cm from the lens. Find the amplitude of oscillation of the image of the particle. An extended object is placed at a distance of 5.0 cm from a convex lens of focal length 8.0 cm. (a) Draw the ray diagram (to the scale) to locate the image and from this, measure the distance of the image from the lens. (b) Find the position of the image from the lens formula and see how close the drawing is to the correct result. 1v-1-5=18⇒1v=18-15⇒1v=-340∴v=-13.3 cmHence, the position of the image from the lens is 13.3 cm. A pin of length 2.00 cm is placed perpendicular to the principal axis of a converging lens. An inverted image of size 1.00 cm is formed at a distance of 40.0 cm from the pin. Find the focal length of the lens and its distance from the pin. v=13.3=403 cm, u=803, u = 26.66 cm. Hence, the required focal length is 8.9 cm and object distance is 26.66 cm. A convex lens produces a double size real image when an object is placed at a distance of 18 cm from it. Where should the object be placed to produce a triple size real image? ⇒ h1h0=vu=2∴ v = 2u = 36 cm. 1v-1u=1f 136+118=1f ⇒ 1f=336⇒ f = 12 cm. Therefore, the object should be placed at a distance of 16 cm in front of the lens. A pin of length 2.0 cm lies along the principal axis of a converging lens, the centre being at a distance of 11 cm from the lens. The focal length of the lens is 6 cm. Find the size of the image. As per the question, the centre of the pin is 11 cm away from the lens. So, the length of the A’B’ = size of the image. 1vA-1uA=1fWhere vA and uA are the image and object distances from point A. 1vB-1uB=1fWhere vA and uA are the image and object distances from point B. 1vB-1-12=16 ⇒vB=12 cmLength of image = vA − vB = 15 − 12 = 3 cm. The diameter of the sun is 1.4 × 109 m and its distance from the earth is 1.5 × 1011 m. Find the radius of the image of the sun formed by a lens of focal length 20 cm. 1v-1u=1fThe object distance is very large as compared to focal length of the lens. Hence, the image is formed at the focus. (m)=vu=h2h1 ⇒ h2=vu×h1 =150×1011750×109×150×1011×0.7×1012 mm=0.93 mmHence, the required radius of the image of the sun is 0.93 mm. A 5.0 diopter lens forms a virtual image which is 4 times the object placed perpendicularly on the principal axis of the lens. Find the distance of the object from the lens. The height of the image is four times the height of the object. 1v-1u=1fHere, v is the image distance and u is the object distance. 1f=P=5 and f=15 m=20 cm14u-1u=120-34u=120⇒u=-604=-15 cmHence, the required object distance is 15 cm. A diverging lens of focal length 20 cm and a converging mirror of focal length 10 cm are placed coaxially at a separation of 5 cm. Where should an object be placed so that a real image is formed at the object itself? Let the object be placed at a distance x cm from the lens (away from the mirror). 1v-1u=1f ⇒ 1v=1(-20)+1(-x) ⇒ v=-20xx+20Thus, the virtual image due to the first refraction lies on the same side as that of object (A’B’). ⇒ v=250(x+4)100-15x⇒v=250(x+4)15x-100⇒v=50(x+4)(3x-20)Thus, this image is formed towards left of the mirror. The object should be placed at a distance 60 cm from the lens farther away from the mirror, so that the final image is formed on itself. A converging lens of focal length 12 cm and a diverging mirror of focal length 7.5 cm are placed 5.0 cm apart with their principal axes coinciding. Where should an object be placed so that its image falls on itself? 1v-1u=1f⇒ 1v=1(-12)+1(-x)⇒ v=-12xx+12Thus, the virtual image due to the first refraction lies on the same side as that of object A’B’. ⇒ v=7.5(17x+60)52.5-127.5x⇒v=250(x+4)15x-100⇒v=50(x+4)(3x-20)Thus, this image is formed towards the left of the mirror. A converging lens and a diverging mirror are placed at a separation of 15 cm. The focal length of the lens is 25 cm and that of the mirror is 40 cm. Where should a point source be placed between the lens and the mirror so that the light, after getting reflected by the mirror and then getting transmitted by the lens, comes out parallel to the principal axis? Distance between convex lens and convex mirror is 15 cm. Focal length (fl) of the lens is 25 cm. Focal length (f2) of the mirror is 40 cm. Let x cm be the object distance from the mirror. A converging lens of focal length 15 cm and a converging mirror of focal length 10 cm are placed 50 cm apart with common principal axis. A point source is placed in between the lens and the mirror at a distance of 40 cm from the lens. Find the locations of the two images formed. Point source is placed at a distance of 40 cm from the lens. It means the point source is at the focus of the mirror. (a) One due to direct transmission of light through the lens. (b) One due to reflection and then transmission of the rays through the lens. 1v-1u=1f⇒ 1v=115+1(-40)=40-1540×15⇒ v=40×1540-15Therefore, v is 24 cm to the left from the lens. (S’) Since the object is placed at the focus of the mirror, the rays become parallel to the lens after reflection. ⇒ 1v-1u=115Thus, v is 15 cm to the left of the lens. Consider the situation described in the previous problem. Where should a point source be placed on the principal axis so that the two images form at the same place? (a) One due to direct transmission of light through lens. (b) One due to reflection and then transmission of the rays through lens. Let the point source be placed at a distance of ‘x‘ from the lens as shown in the Figure, so that images formed by lens and mirror coincide. ∴ Point source should be placed at a distance of 30 cm from the lens on the principal axis, so that the two images form at the same place. A converging lens of focal length 15 cm and a converging mirror of focal length 10 cm are placed 50 cm apart. If a pin of length 2.0 cm is placed 30 cm from the lens farther away from the mirror, where will the final image form and what will be the size of the final image? The pin (object) is placed at a distance of 30 cm from the lens on the principle axis. So, v=(-30)×15(-30+15) =-450-15=30 cmFrom the figure it can be seen that image of the object (AB) is real and inverted (A’B’) and it is of the same size as the object. This image (A’B’) is at a distance of 20 cm from the concave mirror, which is formed at the centre of curvature of the mirror. Thus, mirror will form the image (A’B’) at the same place as (A”B”) and will be of the same size. Now, due to the refraction from the lens, the final image (A”B”) will be formed at AB and will be of the same size as the object (AB). A point object is placed on the principal axis of a convex lens (f = 15 cm) at a distance of 30 cm from it. A glass plate (μ = 1.50) of thickness 1 cm is placed on the other side of the lens perpendicular to the axis. Locate the image of the point object. Therefore, the image of the object will be formed at a distance of 30 cm to the right side of the lens. =1-23=13=0.33 cmHence, the image of the object will be formed at 30 + 0.33 = 30.33 cm from the lens on the right side, due to the glass having thickness 1 cm. A convex lens of focal length 20 cm and a concave lens of focal length 10 cm are placed 10 cm apart with their principal axes coinciding. A beam of light travelling parallel to the principal axis and having a beam diameter 5.0 mm, is incident on the combination. Show that the emergent beam is parallel to the incident one. Find the beam diameter of the emergent beam. Distance between both the lenses is 10 cm. As per the question, the incident beam of light is parallel to the principal axis. Let it be incident on the convex lens. Now, let B be the focus of the convex lens where the image by the convex lens should be formed. 1v-1u=1f⇒ 1v=1-10+1+10=∞⇒ v=∞Thus, after refraction in the concave lens, the emergent beam becomes parallel. PQXY=RBZB=1020=12PQ=12×5=2.5 mmThus, the beam diameter of the emergent light is 2.5 mm. Similarly, we can prove that if the beam of light is incident on the side of the concave lens, the beam diameter (d) of the emergent light will be 1 cm. A diverging lens of focal length 20 cm and a converging lens of focal length 30 cm are placed 15 cm apart with their principal axes coinciding. Where should an object be placed on the principal axis so that its image is formed at infinity? Let (f) be the equivalent focal length of both the lenses. 1f=1f1+1f2-df1f2= 130+120-530(-20)=1120⇒f=120 cmAs focal length is positive, so it will be a converging lens. Let ‘d1‘ be the distance from diverging lens, so that the emergent beam is parallel to the principal axis and the image will be formed at infinity. Thus, it should be placed (120 + 90) cm = 210 cm right to converging lens. A 5 mm high pin is placed at a distance of 15 cm from a convex lens of focal length 10 cm. A second lens of focal length 5 cm is placed 40 cm from the first lens and 55 cm from the pin. Find (a) the position of the final image, (b) its nature and (c) its size. This will be object for the second lens. 1v1=1f1+1u1⇒ 1v1=15-110⇒ v1=10 cmTherefore, the final position of the image is 10 cm right from the second lens. hfinalhi=vu⇒10-10=hfinal-10⇒ hfinal=10 mmThus, the image will be erect and real. (c) Size of the final image is 10 mm. A point object is placed at a distance of 15 cm from a convex lens. The image is formed on the other side at a distance of 30 cm from the lens. When a concave lens is placed in contact with the convex lens, the image shifts away further by 30 cm. Calculate the focal lengths of the two lenses. Let fc be the focal length of the convex lens. 1v-1u=1fc⇒ 1fc=130-1(-15)⇒ 1fc=130+115=330⇒fc=10 cmNow, as per the question, the concave lens is placed in contact with the convex lens. So the image is shifted by a distance of 30 cm. 1vf-1v=1fd⇒1fd=160-130⇒1fd=30-6060×30=-3060×30⇒fd=-60 cmHence, the focal length (fc ) of convex lens is 10 cm and that of the concave lens (fd ) is 60 cm. (a) As shown in the figure, the light rays are falling parallel to the principal axis of the first lens, therefore the rays will converge within the focal length of the second lens. Hence, all the rays emerging from the lens system are diverging. ⇒ 1v1=110+1-5 ⇒1v1=-110⇒v1=-10 cmThus, the virtual image of the object will be at 5 cm from the first convex lens. t<2hg. Consider only the image by a single refraction. A transparent sphere with refractive index μ and a of radius R.
A ball is kept at height h above the sphere. As per the question, at t = 0 the ball is dropped normally on the sphere. Let take the time taken to travel from point A to B as t .
12gt2Where g is acceleration due to gravity. =h-12gt2We are assuming this distance of the object from lens at any time t.
A particle is moving at a constant speed V from a large distance towards a concave mirror of radius R along its principal axis. Find the speed of the image formed by the mirror as a function of the distance x of the particle from the mirror. A small block of mass m and a concave mirror of radius R fitted with a stand lie on a smooth horizontal table with a separation d between them. The mirror together with its stand has a mass m. The block is pushed at t = 0 towards the mirror so that it starts moving towards the mirror at a constant speed V and collides with it. The collision is perfectly elastic. Find the velocity of the image (a) at a time t < d/V, (b) at a time t > d/V. dvdt=-RVR-2(d-Vt)-2VR(d-Vt)R-2(d-Vt)2=-R2V2(d-Vt)-R2This is the required speed of mirror. t>d2the collision between the mirror and mass will take place. As the collision is elastic, the object will come to rest and the mirror will start to move with the velocity V.
u = (d − Vt). 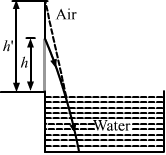 A gun of mass M fires a bullet of mass m with a horizontal speed V. The gun is fitted with a concave mirror of focal length f facing towards the receding bullet. Find the speed of separation of the bullet and the image just after the gun was fired. The focal length of the concave mirror is f and M is the mass of the gun. 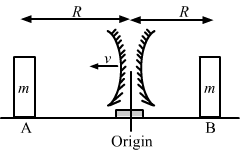 Horizontal speed of the bullet is V.
A mass m = 50 g is dropped on a vertical spring of spring constant 500 N m−1 from a height h = 10 cm as shown in figure. The mass sticks to the spring and executes simple harmonic oscillations after that. A concave mirror of focal length 12 cm facing the mass is fixed with its principal axis coinciding with the line of motion of the mass, its pole being at a distance of 30 cm from the free end of the spring. Find the length in which the image of the mass oscillates. Distance between the pole and the free end of the spring is 30 cm. As per the question, when the mass is released it will stick to the spring and execute SHM. At equilibrium position, weight of the mass is equal to force applied by the spring. =50×10-3×10500=10-3 m=0.1 cmTherefore, the mean position of the SHM is (30 + 0.1 = 30.1) cm away from the pole of the mirror. 12kδ2Where δ is the maximum compression of the spring. R is the radii of curvature of two concave mirrors and M is the mass of the whole system. Mass of the two blocks A and B is mâ€‹. Block B is moving at a speed v towards the mirror. v×Rv=RR distance towards the mirror. 2R3with respect to the given coordinate system. Position of the image of block B is at the same place. 3RvBlock B, after colliding with the mirror must have come to rest because the collision is elastic. Due to this, the mirror has travelled a distance R towards the block A, i.e., towards left from its initial position. Position of the image of block A is at − 2R with respect to the given coordinate system. Image of the block B is at the same place as it is at a distance of R from the mirror. Therefore, the image of the block B is zero with respect to the given coordinate system. Consider the situation shown in figure. The elevator is going up with an acceleration of 2.00 m s−2 and the focal length of the mirror is 12.0 cm. All the surfaces are smooth and the pulley is light. The mass-pulley system is released from rest (with respect to the elevator) at t = 0 when the distance of B from the mirror is 42.0 cm. Find the distance between the image of the block B and the mirror at t = 0.200 s. Take g = 10 m s−2. As per the question, the mass–pulley system is released at time t = 0. Let the acceleration of the masses A and B with respect to the elevator be a.
s=12×6×0.22 =0.12 m=12 cmAs given in the question, the distance of block B from the mirror is 42 cm. 1v+1-30=112⇒1v=1-30=112+130⇒v=8.57 cmHence, the distance between block B and mirror M is 8.57 cm.